These callouses on my palms, dirt still jammed under my fingernails, and bruise on the inside of my foot do not match up to where I am sitting. It’s Monday morning and as my co-workers pound out emails and talk TV shows, I am out of the loop, thinking about scenes from the Fight Club where Ed Norton’s unnamed ‘everyman’ comes to work battered and without explanation. I am, ironically enough, also utterly unaware of what they do with their weekends, though I have my suspicions that it’s fairly pedestrian based on the looks they give me as I tell them, in a cursory manner, where I’ve been. “I cleaned trail all weekend,” I say, “down on the coast.” “In the rain?” they ask. “Why?” To run it, of course; but they are just bewildered and I’ve lost them already. Before I can tell them it’s because I love to feel the power that comes from surging up and over moss-covered rocky cliffs and hurling down long, narrow tunnels of birch and spruce trees canopying knee-deep mud puddles; to be with the rugged, kind people who relish this time of endurance and exertion; to hold court with those of like mind and break bread. And maybe get a few scratches and blisters along the way. What the hell–it’s summer, you gotta’ cram in all the adventure you can. And there’s something to be said, some noble thing to be said when you can drive for a couple of hours to a house you’ve never been to that is home to folks you’ve never met and not once think that there is anything wrong with it. And there is equally something amazing to get there, to walk through the front doors of a 140-year-old homestead to kids who have just met and are already playing on the floor together, and to see straight away that these strangers who have opened their doors and kitchen, guest house and lives to you are going to be your fast friends before even the first pair of sneakers are soaked. There is something to be said for the hope it renews, the civility it nurtures, the excitement it breeds. Something good, something we all need but seems hard to find sometimes. The trail in question–a combination of grown-over, horse-logging roads, immaculate and sinewy singletrack, and freshly rehabilitated ATV doubletrack–had all of the signature marks of being well loved and run almost daily. The moss on all sides was thick and fragrant with a four-inch swath cutting straight to the soft undergrowth down the middle, pruned branches collected to the sides in various states of decay, and brooks bridged with fresh-hewn short logs strapped together as only a seasoned mountain biker knows how to do. Every corner revealed a new series of fast challenges over roots and rocks, down steep embankments, up and over large, downed trees. Our host had us out there to spit and polish it up for the first-annual Herring Run 11k and 22k Race. Our reward–after the raking, trimming, talk, and removal of loose stones–would be to run it together. More than reward enough. The evening before we had all met and gathered around a table that filled, emptied, and refilled with food and woven conversations over and over again as the kids played together and dogs chased each other through the woods and fields until they dropped from exhaustion. We had been given a strip of a local hurricane that morning so as the sun went down, the light turned orange and yellow against low-hanging clouds. Talk was studded with dreams for a clear and wicked summer of racing as we tried, in our Maritime way, to connect families and friends into an ever-narrowing world of four, three, two degrees of separation. Kids tired and food dwindled, once the fire in the stove started to cool and thoughts of an early-morning start crept in, we went to bed, strangely confident that all would be well, that no doors needed to be locked, that having your kids close and your sneakers and kit packed and ready was more than enough to create safety. Clouds gone and heavy dew on the grass, 5:45 a.m. coffee with the host settled into slow talk of the day’s work. Maps from the night before were rehashed and flattened out. We collected rakes, saws, loppers, and gloves and threw them together with our hydration packs, gels, and compression socks–weird and fitting warriors and their armour and tools. A couple of local sailors had been recruited to come out with us–neighbours whose land the trail cut across and good-old boys who had more than enough gumption to help us out for a bit–even if they did openly express their head-shaking disbelief at why any of us would think that running through the woods was any fun at all. The trail was heavy in parts with wet leaves and mud pooling up in the low sections, but the raking was easy–in a light breeze and the freshest of air. As we wound and leapfrogged our way over the moss and solid bedrock, it started to dawn on me how important and nurturing it was to live like this, how not so long ago this was nothing more than a dream, how hard I had worked to get here, with these people, doing this. At 43 and my kids eight and 10, I see that these years are all about being the man that my life has led me to be, that their memories are as dependent on my initiative as their physical health is tied to my knowledge of what is best for them. I see that the world I bring to them, the world that I cultivate around me, needs to not just be satisfying to me, but safe and important and interesting and fun for them, filled with cool people who in turn do important and interesting things. That we are those people. We get back to the house mid-afternoon, quickly kick off wet shoes and swap them for dry ones, stuff a couple of gels into us, throw down the tools and before most of the folks who stayed behind have even realized we are back, we are ready for the ‘reward run.’ The kids, seven of them in all, ranging from one to 10 years old, are playing some crazy game with the hammock. My two catch a glimpse of me and come over. “Are you going running AGAIN?” My daughter asks, smiling and planting one fist firmly on her hip. She’s just so little, but has the mannerisms of her mother. It’s utterly adorable. “Uh, yeah, I am.” She nods. “Cool.” I’m off the hook and off running. The pace is fast: we are moving hard and quick and letting warm muscle carry the day. Over our freshly cleared and narrow trail we accelerate into corners we hardly know at all, grabbing trees to slingshot sharp turns and leap, feet churning air, over jagged rocks and jettison straight off shear dropoffs. We whoop and holler, push at each others’ heels, urging more speed and passing. We stop on top of a rock overlooking a beaver pond, sweat pouring off all of us. I snap a photo. We will want to remember these goofy smiles, these first days of a new friendship. And the kids will one day want to remember us like this too. In Buddhism we say ‘from birth to death, just like this.’ Over the years I’ve taken that in a teen/tween angsty, existential ‘it’s-all-a-mess-anyway’ way, a new parent ‘sometimes-you-just-do-things’ way, and a million other ‘let-me-make-this-fit-my-current-worldview’ ways. These days, it seems like an affirmation and a challenge at the same time: how do you want it to be? Isn’t it just like this? And isn’t it you who got you here by your very own all-too-human power? As a distance trail runner, I’ve found that I’m pretty good at just taking whatever is happening as just that: impersonal, imperfect, and ultimately, undeniable present. See, running teaches me trust, compassion, responsibility, self-reliance, community and, most importantly, how to follow my heart. So I do, just like this–with Monday morning scrapes, continuous trips into the unknown, and smelling of mud included. These lessons have taught me to be a good and loyal husband and father; running has made me strong, fast, and committed as much as it has brought me so much closer to nature; and endurance athleticism has delivered me to some of the finest folks this big ol’ world has to offer. Folks that’ll open up their house to you sight unseen, run with you, and get why you might wish to live this life for some time to come. Does running give you some all-too-human powers, too? 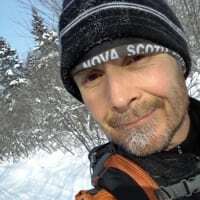 And, in what ways has running connected you with a new place or people in the almost-instant fashion Andrew describes? Andrew Titus lives, raises his family, runs like an animal, and bikes like a beast in the forests and valley of the St. John River in New Brunswick, Canada. Surprise winner of the 2013 Wascally Wabbit 50k, he has found himself in this ultra-distance family among some of the finest folk this big, old world has to offer. Father of three awesome and explosive kids and husband to one remarkable lady, he intends to live this life for some time to come. Great essay Andrew. This reminds how great that weekend was. Great writing! Poetic and insightful. Absolutely fantastic piece. Thank you for sharing this! I know that trail and those folks well. Thanks for sharing your experience and reflection. I love the idea that these years are about being the person your life has lead you to. I'm going to think about that one for a while.